Yeah... I do believe you are! :P But I agree with you... in part. We always have a choice with chocolates, and so is the case with life. We can take our pick from the options available to us, or we can opt not to go for any of them, which is again a choice. 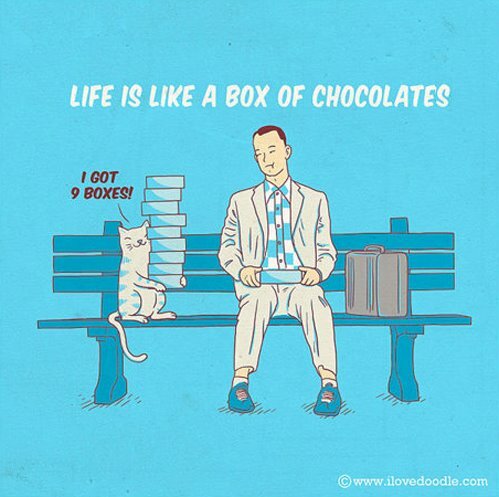 So yeah... life IS like a box of chocolates, though the second part of the quote is completely senseless. Cosmo Kramer: Boys, I'm retiring! Jerry Seinfeld: [Incredulously] From what? well don't take the quote so seriously, it may imply that someone has given u a gift - a box of assorted chocolates, when u open it its a surprise what kind of chocs you may get to eat...so is life..life has its own surprises.. u may like a few surprises, some others you may not...so are random things happening in life. Well gift or no gift, I'd still take my pick from the selection of chocolates presented before me! If there is a Cadbury's Crackle, I'd pounce on it right away! And if there's a Milky Bar (that white chocolate), I wouldn't touch it if it was the only one left in the box! Perhaps, if they were all new flavors to me, I might try them once. In that case, the second part of the quote would make sense.